In the graphic memoir I'm working on, I have to draw myself and my dogs walking (or running, or standing frozen in shock) in the woods. A lot. 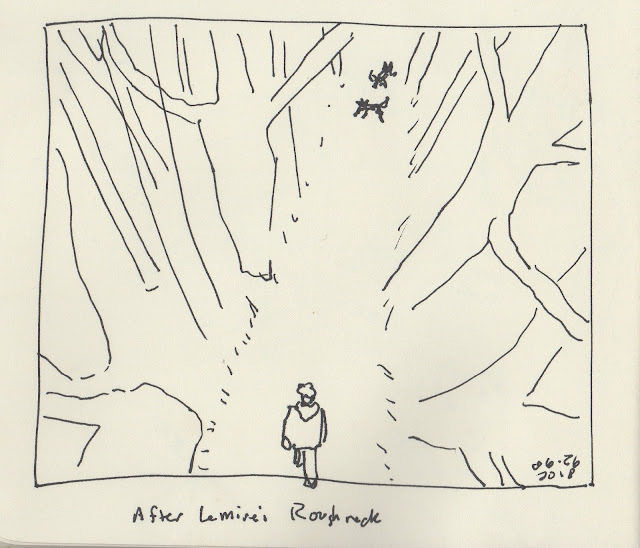 So I've been looking at other comics artists who have drawn people moving through the woods, and copying them, learning from them. I've already posted some of the work I did learning how to draw "Watterson trees" from Calvin and Hobbes strips. Here's a sketch I did inspired by Jeff Lemire's work in Roughneck. A wonderful book, by the way. Full of astonishing visual complexity.